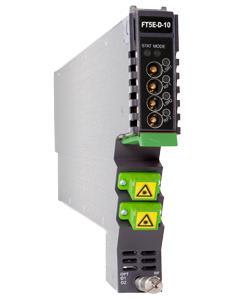 The 1550 nm Forward Transmitter - Enhanced (FT5E) is designed to plug into PBN’s latest Advanced Intelligent Multi-services Access platform - the AIMA3000. PBN’s AIMA3000 FT5E series features full-spectrum enhanced forward transmitters engineered for multi-services operators (MSOs) to increase network capacity to satisfy an ever-growing subscriber demand for bandwidth. The module’s operating wavelength conforms to ITU standards and works with PBN’s Erbium Doped Fiber Amplifier Module (EDFA). It allows for full-spectrum analog / digital broadcast and narrowcast channels, providing the utmost flexibility for MSOs during the transition to all-digital. (4) MER and BER are tested with 117 channels QAM 256 (ITU-T, J.83 Annex-A), flatness. EDFA launch power 16 dBm to 12 km fiber. MER and BER are measured using a PBN reference receiver, and -5 dBm optical receive level, 0 dB tilt.